"The desert snail at once awoke and found himself famous"
A certain famous historical desert snail was brought from Egypt to England as a conchological specimen in the year 1846. This particular mollusk (the only one of his race, probably, who ever attained to individual distinction), at the time of his arrival in London, was really alive and vigorous; but as the authorities of the British Museum, to whose tender care he was consigned, were ignorant of this important fact in his economy, he was gummed, mouth downward, on to a piece of cardboard, and duly labelled and dated with scientific accuracy, 'Helix desertorum, March 25, 1846.' Being a snail of a retiring and contented disposition, however, accustomed to long droughts and corresponding naps in his native sand-wastes, our mollusk thereupon simply curled himself up into the topmost recesses of his own whorls, and went placidly to sleep in perfect contentment for an unlimited period. Every conchologist takes it for granted, of course, that the shells which he receives from foreign parts have had their inhabitants properly boiled and extracted before being exported; for it is only the mere outer shell or skeleton of the animal that we preserve in our cabinets, leaving the actual flesh and muscles of the creature himself to wither unobserved upon its native shores. At the British Museum the desert snail might have snoozed away his inglorious existence unsuspected, but for a happy accident which attracted public attention to his remarkable case in a most extraordinary manner. On March 7, 1850, nearly four years later, it was casually observed that the card on which he reposed was slightly discoloured; and this discovery led to the suspicion that perhaps a living animal might be temporarily immured within that papery tomb. The Museum authorities accordingly ordered our friend a warm bath (who shall say hereafter that science is unfeeling! ), upon which the grateful snail, waking up at the touch of the familiar moisture, put his head cautiously out of his shell, walked up to the top of the basin, and began to take a cursory survey of British institutions with his four eye-bearing tentacles. So strange a recovery from a long torpid condition, only equalled by that of the Seven Sleepers of Ephesus, deserved an exceptional amount of scientific recognition. The desert snail at once awoke and found himself famous. Nay, he actually sat for his portrait to an eminent zoological artist, Mr. [A.N.] Waterhouse; and a woodcut from the sketch thus procured, with a history of his life and adventures, may be found even unto this day in Dr. [S.P.] Woodward's 'Manual of the Mollusca,' to witness if I lie. The most interesting example of resuscitation occurred to a specimen of the Desert snail, from Egypt, chronicled by Dr [William] Baird. This individual was fixed to a tablet in the British Museum, on the 25th of March, 1846; and on March 7th, 1850, it was observed that he must have come out of his shell in the interval (as the paper had been discoloured, apparently in his attempt to get away); but finding escape impossible, had again retired, closing his aperture with the usual glistening film; this led to his immersion in tepid water, and marvellous recovery. He is now (March 13th, 1850) alive and flourishing, and has sat for his portrait. Manual of the Mollusca refers to the snail's portrait-taker as the artist "Miss A. N. Waterhouse of Marlborough House." Whatever the origin of Miss Waterhouse, in March 1850, Marlborough House would have been standing "vacant [after] the unfortunate death of the late Queen Dowager" in 1849. But there seem to have been artists attached to Marlborough already; by at least August 1850 it was being used as an art display gallery, and by 1853 Marlborough was in use as the National Art Training School, later the Royal College of Art. And that was most of the information about the snail that I could find on my own. So I turned to the expertise of Ask Metafilter! In March 1846, a series of shells was presented to our national collection by Charles Lamb, Esq., from Egypt, Greece, &c. Amongst them were several specimens of an Egyptian species, the 'Snail of the Desert," the Helix desertorum of authors, and which is found in great abundance living in the dry and arid deserts of Egypt and Syria. These shells had been packed and carried through a considerable part of Europe before they found their way into the gallery of the Museum, where they were deposited and fixed with gum upon their tablets on the 25th of March. Immured in their prison they remained for four years, without giving any sign of vitality. At the end of that time, however, in the latter part of March 1850, it was observed that on the mouth of one specimen a fresh, thin, glassy covering (called by conchologists the epiphragm) had very recently been formed. The specimen was immediately detached, and immersed in tepid water. After the lapse of a period not exceeding ten minutes, the animal began to move, put forth its horns, and cautiously emerged from its shell. In a few minutes more it was walking along the surface of the basin in which it was placed. The last time it had exercised its locomotive faculty was in the sandy plains of Egypt, not far from the banks of the Nile. Now it awoke to find itself crawling on the surface of a delf basin in the heart of London! Great care was taken of this 'helix rediviva.' It was placed in a tall glass-jar, eighteen inches high, with considerable space to move about in, and supplied with food, which it ate readily, though in small quantities. Cabbage-leaves formed its favourite repast, and were preferred to lettuce or any other vegetable. In this tranquil state of existence it remained till March 1851, when it resumed its torpid condition, shut itself up in its shell, and took an eight months' nap, awaking once more on the 9th of November to eat cabbage-leaf and perambulate the circumference of its glassy prison. Though quite lively, it again became torpid on the 15th, as if conscious the season of the year was not propitious, and never afterwards emerged from its shell. It was found dead, and perfectly dried up, in March 1852. 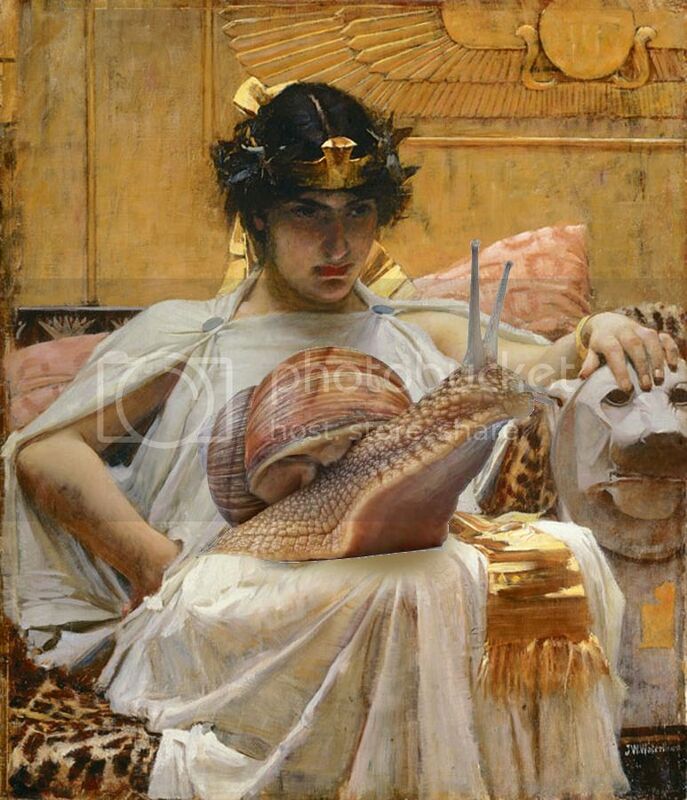 Such was the end of the Egyptian snail, and it was with some feeling of regret that its death was recorded. 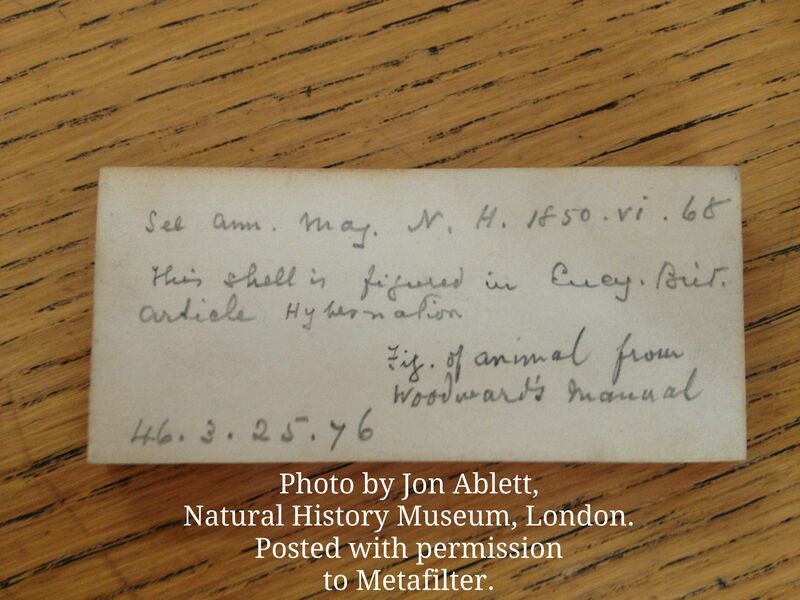 Thanks to AskMe, I contacted Jonathan Ablett of the Natural History Museum, where the pre-1881 natural history exhibits of the British Museum now reside. Mr. Ablett is the Curator of Non-Marine Mollusca and Cephalopoda at the Museum, and he was kind enough to answer several questions about the famous snail and to provide photographs of its shell from the Museum archives! They are posted here to Metafilter with his permission. I am so glad you enjoyed the tale of the desert snail, it really is a wonderful story and I often use it in my talks and lectures. Yes we do have the specimen in the collection, when it died it was placed back on the display board where it was originally attached. The specimen was registered as 1846.3.25.76 and the locality is recorded as Egypt, collected by C. Lamb Esq. Most snails can hibernate in winter or aestivate in summer when conditions are unfavourable but I believe that the desert snails are one of the longest recorded cases of this that has been recorded. Thank you very much, Metafilter and Mr. Ablett! If you have any additional interesting information about the legendary desert snail, please feel free to share! This looks absolutely fascinating. I'll check out the links in a moment, but my already-raised ears doubly pricked-up when you mentioned Grant Allen who will always be Olive Pratt Rayner to me. Bah!!! Texas has this beat. There was, of course Old Rip. These things matter after all. Fantastic post, and an oddly moving story. How persistent is life in the most inimical circumstances! Well, obviously this place has just gone completely to hell since Matt left. Hooray! This has got to be a part of site history, now. Thanks for sharing nicebookrack, it's an incredible story. Really love this post a lot! Very cool! I suppose it might be useful for a desert-based snail to hide away until water becomes available again. I loved the Ask question so much that I've been telling people about the amazing snail. Thanks for this post too, so fascinating! What a lovely story! How is this not a children's book? The fact that they retained and re-affixed the snail to the original display board is the most British thing I have read in years. Yay! I enjoyed seeing this play out in AskMe and it makes a great FPP. First inline images, and now this? 'Curator of Non-Marine Mollusca and Cephalopoda' sounds like a character's title from A Series of Unfortunate Events. He is going to be either unhelpful, outright obstructive or murdered. I am disappointed with ancient Egypt that they don't have a resurrecting snail-headed god. Murdered by the Curator of Marine Mollusca and Cephalopoda, obviously. OK, that was a reach, but this is a great post! Hooray! I love everything about this. Yay! I've been hoping you'd make this post. Now going to read all the parts. Maybe we should put this account in some tepid water? Can the mods tell us if the surface it is affixed to is discolored? Hmm. The snail awoke in the spring, which makes sense given that snails tend to hibernate during the winter. But why did it stay dormant for several years? I wonder if the temperature or humidity appreciably changed in the museum just prior to March of 1850. If your screen appears to have faded to white, submerge your laptop to see if the dormant account awakes. ...will be the first post on Cthulhu's Facebook wall. This is pretty much the most amazing post ever. "Wait, it looks like it wants to say something!" "Hold it up so we can hear it!" "I can't understand it. Kuth-hoo-loo? Cth-ul-hu? Cthulhu?" "Hey, do you smell brimstone?" Whatever you do, do NOT go to it's IP address. Sometimes, a snail needs to rest up before it goes to battle with knights. This is an excellent - quintessential, even - MetiFilter birthday post, combining all the things I love about MetiFilter into one tiny little snail. I wonder if the temperature or humidity appreciably changed in the museum just prior to March of 1850. Frost occurred infrequently during February, relative to normal. At Greenwich, for example, the minimum temperature was just - 1.1˚C on the 14th; the following night the minimum was 10.7˚C - a remarkably high reading for February. So yeah, wet and warming up. So my new word of the day is 'aestivate'... which I have been know to do during particularly hot weather. Could the snail-artist Miss A.N. Waterhouse be related to any of London's more famous contemporary Waterhouses? The Manual of the Mollusca preface thanks both Miss Waterhouse and a Mr. Waterhouse, who I assume was a scientist or someone else connected to the museum. Perhaps "Mr. Waterhouse" was architect Alfred Waterhouse, who designed the Waterhouse building at the Natural History Museum. And the parents of painter John William Waterhouse, William and Isabella Waterhouse, were both painters alive during this time. Or perhaps A. N. Waterhouse is from a completely different, yet still artistic, branch of the Waterhouse clan! There's a poignant, Flowers For Algernon, quality to that conclusion. This is probably way too late, but the "whois" for that IP is in Moscow. Caveat Inspectoris. Wait, how has The Whelk not chimed in? Is he OK? Does anyone know him in real life? Can you check to make sure he's not been tacked to a specimen board? The thing that delights me most about this snail's story is how clearly the scientists involved were delighted by it. The story essentially went viral among the snail-science publications of the day, in part due to scientific interest in snail hibernation, but largely because science writers were so amused by the idea of a little snail blithely snoozing away unnoticed while glued to a specimen card. And the plucky little survivor snail was rewarded with a rare happy ending, cared for with cabbage in the height of domestic snail luxury. "Who shall say hereafter that science is unfeeling!" And the parents of painter John William Waterhouse, William and Isabella Waterhouse, were both painters alive during this time. If John William Waterhouse had been around, it would have looked like this. Ooh, the Natural History Museum, London, has tweeted about us! Thanks again for the help, NHM! This post has made my whole day! Thanks for posting the followup to your AskMeFi! This post also sort of spawned a new Metafilter Podcast episode / style / series.